Moderne luksushus i hjertet av Golden Circle - vinter og sommer! 5 soverom (inkl ett gjestehus), 3 bad, soveplass til 12. Grund er et moderne luksushus 220 kvm. kun 45 minutters kjøring fra Reykjavik med badestamp, dampbad, vaskemaskin og tørketrommel, internett wi-fi, TV. Perfekt eiendom for alle som ønsker å se noen av de vakreste severdighetene i Island og slappe av med all den komforten du kan forestille deg. Små fotballbaner w mål hvis du vil spille og flere golfbaner i nært hold. Ligger i hjertet av 'Golden Circle' den berømte sightseeingturen. Registreringsnummeret til Grund er HG-00001169. The house is very convenient to see the Golden Circle sights and not too far from spots in Reykavik or Southern coast. House was spacious and easily accommodated our family. House was pretty well stocked with kitchenware and cooking supplies. Only thing we wished it had was a tv in the living room instead of the tv room upstairs that is also a bedroom that can sleep 3. All in all we were very pleased with the house and the location. Lovely house in a prime location. We will stay there again! The only thing I recommend is making sure you purchase toilet paper and laundry detergent. We had no toilet paper after day 2 and detergent is not supplied. This house was perfect for our family of 9. 8 adults and a two year old. All the conveniences of your own home. Location was superb. Close to all visiting sights. Selfoss is a 15 minute drive and has Kronan grocery store for you to stock up. Two things I would change is having a TV in the living room as after a busy day sightseeing we wanted to huddle as a family and relax with TV and unwind. Second is to change the couch as it pretty tired looking. Other than that, it was an amazing trip and we would definitely rent this house again. The owners were very quick to respond to any questions we had. Das moderne Luxushaus, in welchem es wirklich auch an nichts fehlte, ist der idealer Ziel- und Ausgangspunkt für einen eindrucksvollen Erholungsurlaub in Island! Die Organisation und Buchung war sehr einfach und informativ. Die Betreuung vor Ort durch Thorsteinn war schnell und direkt! Sehr empfehlenswert!!!!!!! We had a wonderful stay with Thorsteinn! It was spacious, well equipped, clean, safe and absolutely the perfect place for my family to spend the holidays (and my 60th birthday). It was the perfect location for us to see the Northern lights, and we did, on my birthday! Not sure how he arranged that but I'm forever grateful. Everything we could want was there and more! The hot tub was lovely and the perfect setting to await what the sky might bring each night. The home was lovely and provided us all the comforts we could hope for to celebrate the holidays in Iceland, memories that will be with us for a lifetime. Again, it was all we could want and more. The home was everything we imagined it would be and more! Very spacious and inviting with every convenience one could need on vacation to relax with family and friends. 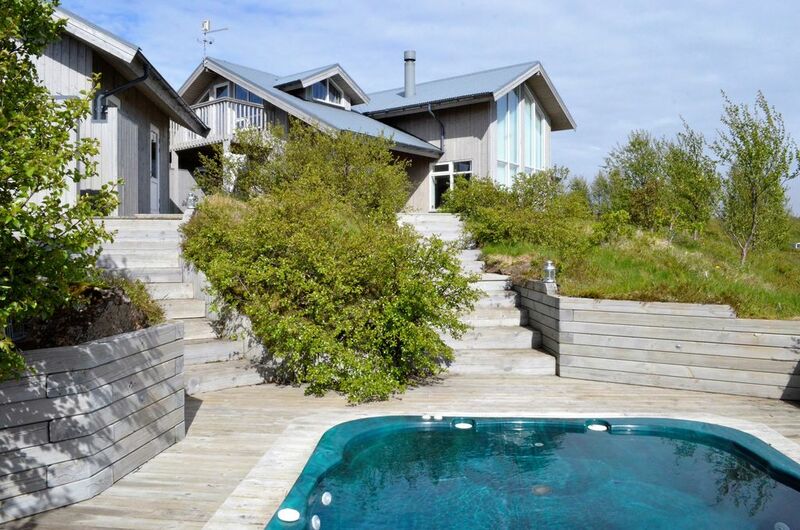 We enjoyed the remote location of the home as well as easy access to nearby shopping, gas, and all the sights you journey to visit in Southern Iceland. Highly recommend! Huset ligger bare 50 minutters kjøring fra Reykjavik i et rolig område nær innsjøen Thingvallavatn, en del av den gylne sirkel (en av de må se stedene på Island). Sin nærmeste landsby Selfoss er appox 15 min kjøring med alle tjenester som trengs. Utmerket turterreng rundt og bare 20 min kjøring fra innsjøen Laugarvatn. Geysir og Gullfoss to av de mest besøkte severdighetene er ikke langt. To gode 18 hulls golfbaner 7 km (Öndverdarnes) og 13 km (Kidjaberg) unna.